Over the years, I’ve figured out some tips to find the best deals. I’ve even learned some tips to make the day even less stressful for myself—and others. Here are some of my favorite tips. You might already know some of these, but there may be a few that are completely new to you. Whatever the case, these ideas will help you navigate one of the most popular shopping days. It’s always fun to get a good deal. An simple way to do this is to shop with discounted gift cards. Before going out to shop, visit Gift Card Granny to find discounted cards. You’ll find gift cards for hundreds of retailers, including Macy’s, Kohl’s, Target, Walmart, and many more. When you decide which stores you will shop at this year, visit each of their websites and sign up for email newsletters. Try to also follow the on social media where they will post deals. With the number people trying to get deals, there will be instances where you won’t find the item that you want. That means that you need to have a backup plan in place. It’s a good idea to add a second item to your list, just in case you can’t find the one item that you really want. Not only is it more fun to shop with someone, but it can be quite helpful too. If you have a few must-have items on your list, you can work together to find them. You friend can visit the electronics department for the tablet that you want while you go to the toy aisle to find another item on your list. Once you have your list, figure out which stores that you will need to shop at first. I recommend that you start with the one that has that must-have item. You can then decide which ones to go to after that. It may be based on your list or a certain route. Most stores suspect all price matching policies on Black Friday. This includes Target, Walmart, and Best Buy. Don’t bother with even attempting to match another store’s price. Sometimes, the Black Friday prices are not always the lowest prices. Visit the store on Wednesday to find out. You may find that the price listed is the same as, if not lower than, what you will find in a couple of days. Go ahead and grab that item while you can. This is also true with the “hot” holiday toys. If you find one in the store before the shopping frenzy hits, make sure to grab it to ensure that you have one for Christmas. This is also the time to figure out the other items that you want and where they are in the store. This way, when you get there on Friday, you know where to go to get the gifts on your list. Many stores now start to put items on sale online before Black Friday. This can mean great deals that won’t be available later in the week. Make sure to check the websites of the stores that you intend to shop. When I shop during this time, I make a list of events coming up in the following year. For instance, if I know that someone is getting married the next year i look for appliances or household items that they might want. I even pick up smaller toys to put in my gift closet for kids’ parties for the following year. There are deals happening everywhere. It can be overwhelming to now which stores will offer you the best prices on the items that you want. Here is my guide on where to shop for items. If shopping in stores on Black Friday isn’t your thing, you’re in luck. Many of the same in-store deals are also available online. The only items that you won’t find are the doorbusters. This means getting out on Thursday night or getting up early on Friday, but the sooner that you can get to the store, the more likely that you will find the items that you want. Stores want to keep shoppers in the store all day long. They sometimes offer late shopper deals in addition to the early bird offers. Watch the ads to find out which items will be discounted later in the day. You might be able to sleep in, avoid the crowds and still get an amazing deal. Before you even make a list, you need to know your budget. Once that is set, get the amount of cash that you’ll need and leave your credit cards at home. This will make you think more about every purchase and help reduce impulse shopping. There is no way that you can overspend—as you don’t have the money to do it. Retailers want to get you into their store to shop. One way that they often do this is with doorbusters. Make sure to read the ads carefully. many times these are limited to 25—100 items. That means, that if you’re not in line super early, you won’t get the deal. If you really want a doorbuster deal, watch for ones that have a shopping guarantee, such as shoppers in the store at a certain time will be guaranteed to get that item. 17. Not everything is really a deal. Not everything on Black Friday is a deal. Often times, stores don’t have to offer their lowest prices until closer to December 25th. That may mean that an item on sale at 30% off might drop to 40% off or more the closer that you get to Christmas. Always check the original sticker price on the product or the shelf. Compare that to the discount to see if its really a good deal. not all items will be deeply discounted, so don’t fall for the hype of the shopping season. Another thing that you should check is for the inflated discount. This is when stores will say an items is on sale for $69.99, down from $139.99. In your mind, of course you see a deal. However, a little bit of research shows you that the retail price was too high to begin with and everyone offers that item for that same price. It’s truly not a deal and you might want to pass and wait for a better offer. Make sure you know how long you have to return items. Some stores have a liberal return policy for items purchased on Black Friday and during the holidays. However, it may also be valid for only 30 days. If you buy something and someone doesn’t like it, there’s a good chance they won’t be able to return it. In addition, get gift receipts for the items that you buy. It will make it much easier on your recipient, should they want to return or exchange something. 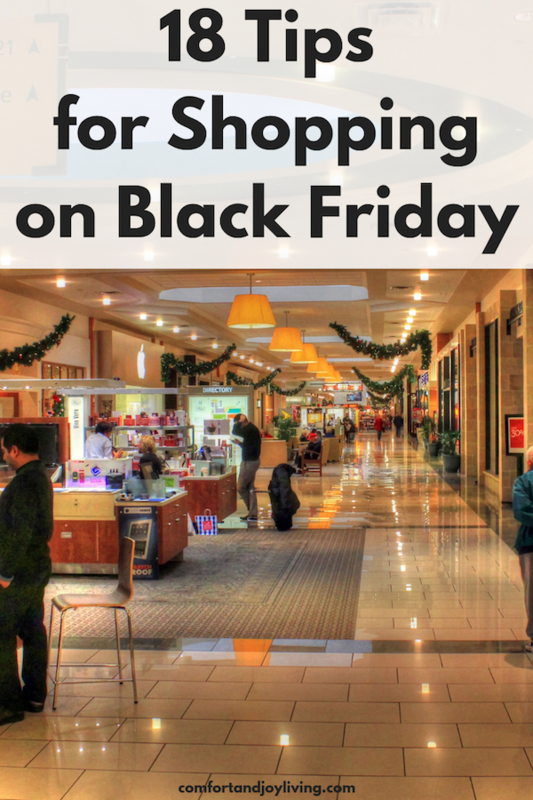 What tips do you have for shopping on Black Friday?